I love this bird bath. After spending large amounts on fancier baths that break too quickly I was so glad to find this one. I've had it once before and it lasted for years. 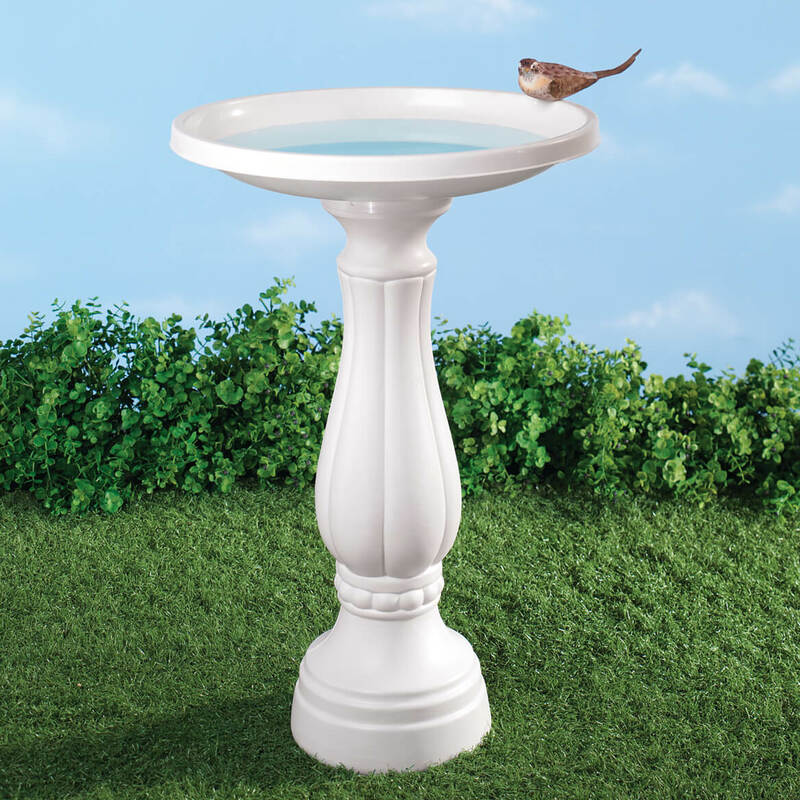 The best bird bath ever, great PRICE. Since this is very light weight plastic. we filled the bottom part with sand to make it solid and steady and we put water sometimes for the birds, and sometimes birdseed. The little birds like it a lot and it is fun to see then enjoying themself. I like to take pics on my cell phone of them . Very nice item . Bird Bath is worth it. As one reviewer wrote, it is helpful to add something in pedestal so on windy days it won't fall over or if an animal hops up on it , it won't fall over. I even add water in pedestal if I don't have sand or small rocks. You do have to make sure it is on level ground even if you put a square block under it to level it. All bird baths can tilt, so you just adjust it level as you would anything else. To me, this is well worth the money especially if you have many birds or other animals looking for water. Mine have lasted several years. Refresh the water often, clean it out periodically with a bleach solution and rinse it out again and put fresh water in it. I think it will be very easy to use. using for garden. 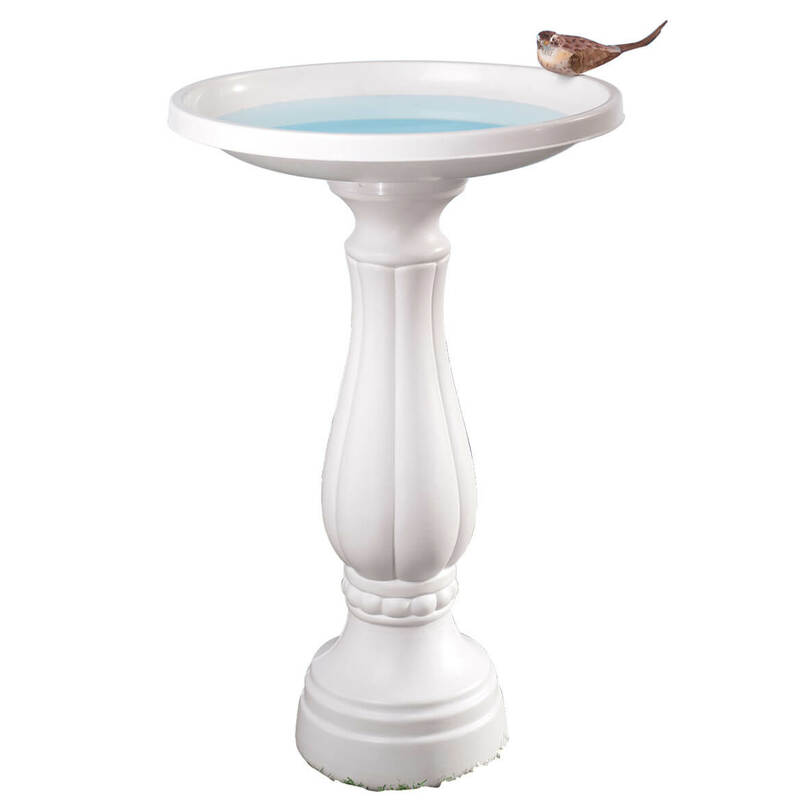 I have ordered this bird bath in recent month and have many times in the past. I left the last one at previous home for new owners to have and so the birds still had water, but I will always buy these. I put water in the base to give it sturdiness or dirt or sand and it works beautifully. I love the white, it shows off in the yard and sometimes I will put a seashell in the center of it for other things to fly on to reach the water. Easy to clean with a little spray bleach and a brush , they rinse, refill with water and its good to go for weeks. Can't go wrong with this price. I used them over 10 years now. These are so good for the price. I add water to inside the base to make it sturdy and it never blows over or is knocked over as a result. You could spray paint the base different colors too because of the plastic. I once had one so long that the white was looking less white from age (many years old) and I sprayed it gloss white again. But they are such a bargain for helping birds have water and insects try it out too now and then that its worth buying. I have one in the front yard and back yard. Clean it out with a brush every so often as you would anything outside with standing water. I placed one in the garden and one away from the house in the back yard near the feeders. They don't get hot like metal baths and are easy to clean. It could use a fourth screw however. I HAD LOOKED A LONG TIME, AT STORES AND STORE WEBSITES FOR THIS TO REPLACE MY VERY OLD ONE CUZ THE DISH WAS GETTING UGLY. THANK YOU MILES KIMBALL !! FOR SELLING THIS. Very easy to assemble and put in the yard. I was delighted to find this plastic bird bath on your site. I searched all stores that carry bird bathes and could not find a plastic, inexpensive one. We are in the process of selling my parent's house, it is an estate, and I wanted to place a bird bath in the yard where my Mother always had one. This was perfect for what I needed it for. Thanks for helping me bring back some wonderful memories. A great product for the money! This birdbath was just what I was looking for. Had one and needed a new one and couldn't find this kind of birdbath anywhere. Everone that I looked at was low to the ground and very expensive. Thanks for having exactly what I wanted. My old ones was was to the point I could not keep clean, with all groves. Just set this one up, very sturdy. Missed my birds. I had one like this before, and really had good luck with it. Best Bird Bath For The Money! This is a replacement bird bath. I loved the first two bird baths. They lasted almost 5 years and that's in the tough New England climate. We had a bad winter. If the bird bath hadn't fallen over with ice in it, it probably would have been alright. Thank you for selling a great product. I am waiting for the weather to put mine out. I'd like the birds in my trees to have some water available to them. Easy to fill, the screws were NOT there but I found some that worked. it is a becoming bird bath that will enhance my garden. This was a very good choice for me. This product was good for me as I had no way to transport and set up a concrete one. It is easy to clean and looks good in the yard. Bought it for my grandchildren to enjoy watching all the birds. They love it. 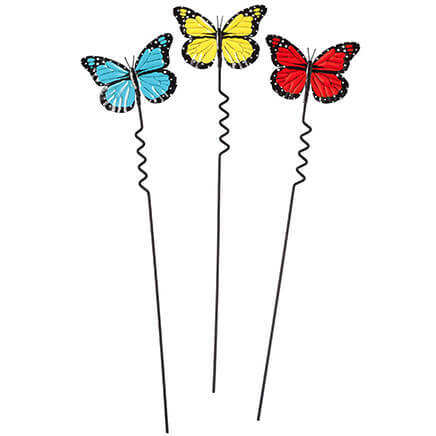 I owned this product before and I and the birds loved it. When after 8 years the bird bath finally broke in the center...I searched every where in retail stores in and out of my area for the same bird bath. No one carried this product. When I saw it in Miles and Kimball catalog I was ecstatic! I immediately ordered it and was so pleased when I received it. The birds went to it immediately to my watching the birds pleasure. The birdbath is perfect. I had one for many years and it finally gave out. I was so happy to see it in your catalog. We sand the middle and paint it a pretty (non-toxic) robin's egg blue. It contrasts very pretty with the white base. Thanks ! I put the birdbath in my flower garden with different shaped and colored rocks in it for the birds to stand on. It is very beautiful. Sturdy, durable, easy to clean. This is the perfect bird bath for my yard; I did add some rocks in the water so that the birds could perch there when they bathe. fill base with rocks, sand, or water if weather permits. This is a light weight cute bird bath. It's inexpensive and if you look closely, it looks it, but it's what I expected considering the price. As I experience the item has a bit off balance but everything's are fine. I bought a product like this 20 years ago and it finally crumbled. I bought this to replace it; it looked identical however it's not as durable and sturdy as the original. Even with the base filled to the max with rocks, animals can still tip it over. Otherwise, no complaints. If you read the comments which I did and it was what I expected. I had to add extra support to hold the water. For the price this was what I thought it would be. This is a nice, inexpensive bird bath, but it has one real flaw. The bowl that holds the water is not heavy enough and flexes once you add water. As a result, the water spills out one side that the top is never level. A better design would have been to add ribs to the bottom of the bowl, to keep it from flexing. I am very disappointed in this purchase, it is very cheaply made the top slants so much that it will not hold water.Would I refer this to a friend NO way. The bottom is sturdy (after I filled it with sand) but the top is VERY flimsy, tilts when water is added & the water spills. the bottom is sturdy but the top is VERY unsteady and spills the water leaving little in the top.The top tilts to one side because it is so very UNSTABLE. The bowl is flimsy and tips no matter how you try to adjust it. It is too much trouble to return it or I would. It doesn't sit flat on the ground. The water is higher at one end than the other. What a piece of junk! Miles Kimball really blew it on this. I should get some money back for keeping it. Terrible Bird Bath - don't waste your money! The base of this bird bath is fine. You need to add sand for weight but the top is made of soft plastic and very flimsy. The product comes with 3 screws to attach the top to the base. They don't work very will and the top leans from side to side depending upon where the birds land. The shifting scares them. It is awful. Shame on the manufacturer for creating such an low quality product. This bird bath is made out of to soft a plastic. When water is put in the bowl on top it shifts either way and the water flows out. A bird or squirrel tried to bath or drink water out of it the first night I had it up. It tipped over smashing my flowers. I have the base loaded with rocks but it didn't help. Top is too weak. I find that it is too light and tips easy with the lightest bird and all the water leaks out as it is leaning over. The bowl is too light. I have redone my pool and have removed bushes and have made a beautiful area for a birdbath. I hope to surround it with the blue flowers I ordered too. attractive, a good simple design, easy to keep clean. It is rather hot and dry here at this time of year. The local birds need a close place to drink and bathe. My Aunt had one when I was growing up, and it lasted forever. Old one just wore out ..over 20 yr. old. Desired one similar to what my parents had in their front yard. Plastic birdbaths are getting harder to find. Wanted to attract more birds to my backyard. Have had same in past and like it. Love this bird bath. the one I had finally saw it's last days. 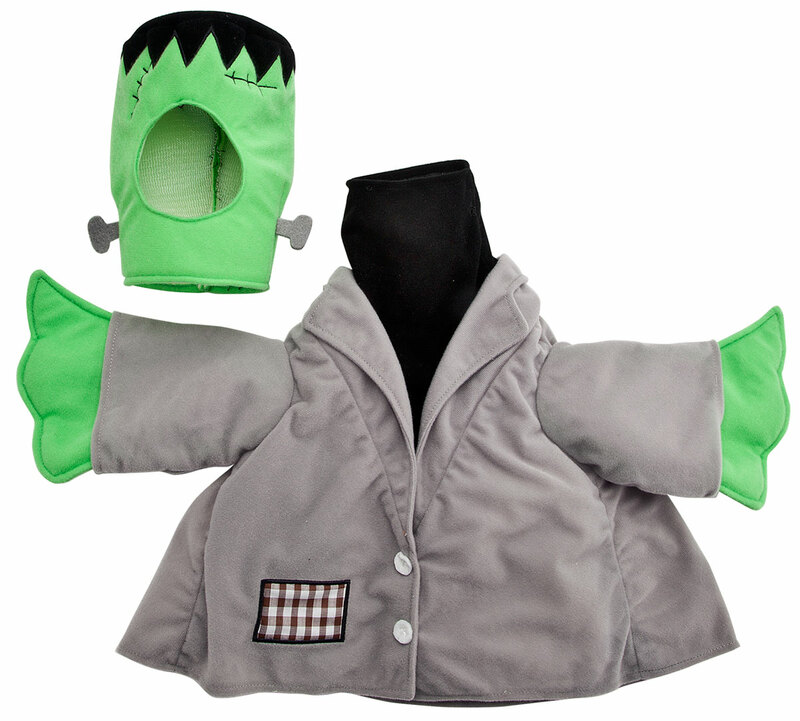 It was the same as this one so I want one to replace the one I had. I liked the shape and that its light weight. We feed the birds daily and then why not have a bath ready for them as well as water to drink? Love to watch birds from our patio window. Birds love it and it's very easy to clean. I can keep it out all during a Michigan winter. Looks like my old one I have which needs replacing. wild birds like to bathe in this birdbath more than any other ones I have in my yard. The price was right so I purchased this one and another type. I've been looking for one. Finally found one. It might be fun to offer water to birds, they are always trying to land near my pool. Small enough to fit in our backyard. As an avid Bird Watcher, I hope to bring more birds into my garden year-round. My cat managed to destroy the previous bird feeder (a stake type). I read you can fill the bottom with sand to stabilize it so it's a sturdier option as bird feeder. need a bath that can be anchored against the wind. I have many birds that visit my back yard daily and I needed a simple bird bath for them. I am going to make a fountain out of it. I hope. To turn it into a zen fountain as well as to entice birds. Please deliver only on a Monday or Tuesday.